The electron is a subatomic (smaller than an atom) particle that carries a single unit of negative electricity. All matter consists of atoms that, in turn, contain three very small particles: protons, neutrons, and electrons. Of these three, only electrons are thought to be fundamental particles, that is, incapable of being broken down into simpler particles. The presence or absence of an excess of electrons is responsible for all electrical phenomena. Suppose a metal wire is connected to two ends of a battery. Electrical pressure from electrons within the battery force electrons in atoms of the metal to flow. That flow of electrons is an electric current. The protons and neutrons in an atom are packed together in a central core known as the nucleus of the atom. The size of the nucleus is many thousands of times smaller than the size of the atom itself. Electrons are distributed in specific regions outside the nucleus. At one time, scientists thought that electrons traveled in very specific pathways around the nucleus, similar to the orbits traveled by planets in the solar system. Energy level: A region of the atom in which there is a high probability of finding electrons. Nucleus (atomic): The central core of an atom, consisting of protons and (usually) neutrons. Positron: The antiparticle of the electron. It has the same mass and spin as the electron, but its charge, though equal in magnitude, is opposite in sign to that of the electron. But it is known that the orbit concept is not appropriate for electrons. The uncertainty principle, a fundamental law of physics (the science of matter and energy), says that the pathway traveled by very small particles like an electron can never be defined perfectly. Instead, scientists now talk about the probability of finding an electron in an atom. In some regions of the atom, that probability is very high (although never 100 percent), and in other regions it is very low (but never 0 percent). The regions in space where the probability of finding an electron is high corresponds roughly to the orbits about which scientists talked earlier. Those regions are now called energy levels. suggested some years earlier by Irish physicist George Johnstone Stoney (1826–1911). Although Thomson was able to measure the ratio of electric charge of mass (e/m) for an electron, he did not know how to determine either of these two quantities individually. That problem puzzled physicists for more than a decade. Finally, the riddle was solved by American physicist Robert Andrew Millikan (1868–1953) in a series of experiments conducted between 1907 and 1913. The accompanying figure outlines the main features of Millikan's famous oil drop experiment. The oil drops needed for the experiment are produced by a common squeeze-bulb atomizer. The tiny droplets formed by this method fall downward and through the hole in the upper plate under the influence of gravity. As they fall, the droplets are given a negative electric charge. Once droplets enter the space between the two plates, the highvoltage source is turned on. 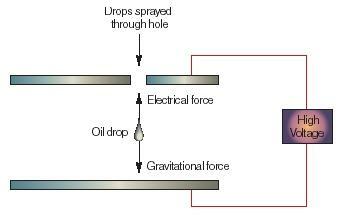 The negatively charged oil droplets are then attracted upward by the positive charge on the upper metal plate. At this point, the droplets are being tugged by two opposite forces: gravity, pulling them downward, and an electrical force, pulling them upward. How would you send a letter to an electron? 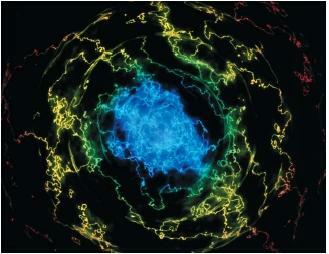 As strange as that question seems, electrons have "addresses," just as people do. Think of an oxygen atom, for example. Every oxygen atom has eight electrons. But those eight electrons are all different from each other. The differences among the eight electrons are represented by quantum numbers. A quantum number is a number that describes some physical property of an object (in this case, of an electron). We know that any electron can be completely described by stating four of its properties. Those properties are represented by four different quantum numbers represented by the letters n, ℓ, m ℓ , and s. Quantum number n, for example, represents the distance of an electron from the nucleus. Any electron for which n = 1 is in the first orbit around the nucleus of the atom. Quantum number ℓ represents the shape of the electron's orbit, that is, how flattened out its orbit is. Quantum number m ℓ represents the magnetic properties of the electron. And quantum number s represents the spin of the electron, whether it's spinning in a clockwise or counter-clockwise direction. So if you decide to send a letter to electron X, whose quantum numbers are 3, 2, 0, + ½, you know it will go to an electron in the third orbit, with a flattened orbital path, certain magnetic properties, and a clockwise spin. One of the interesting detective stories in science involves the discovery of an electron-type particle called the positron. During the 1920s, English physicist Paul Dirac (1902–1984) was using the new tools of quantum mechanics to analyze the nature of matter. Some of the equations he solved had negative answers. Those answers troubled him since he was not sure what a negative answer—the opposite of some property—could mean. One way he went about explaining these answers was to hypothesize the existence of a twin of the electron. The twin would have every property of the electron itself, Dirac said, except for one: it would carry a single unit of positive electricity rather than a single unit of negative electricity. Dirac's prediction was confirmed only two years after he announced his hypothesis. American physicist Carl David Anderson (1905–1991) found positively charged electrons in a cosmic ray shower that he was studying. Anderson called these particles positrons, for posi tive elec trons. Today, scientists understand that positrons are only one form of antimatter, particles similar to fundamental particles such as the proton, neutron, and electron, but with one property opposite to that of the fundamental particle. Hello. I wanted to ask a question about electrons changing their energy levels. Does this mean that electrons jump an electron shell? And if all of them do this, then I guess the first one doesn't exist anymore and the atom is the same... I just don't understand what electrons "changing their energy levels" means. Does it means that the electrons themselves are more negatively charged maybe? What does electron charge mean? Why is it that there are positive and negative charges?